Our cells are full of clocks … circadian clocks … whose transcriptional and translational feedback loops at the ancient PER locus oscillate with a period of 24-ish hours … complete with diurnal peaks of vulnerability to cardiac arrest and death. 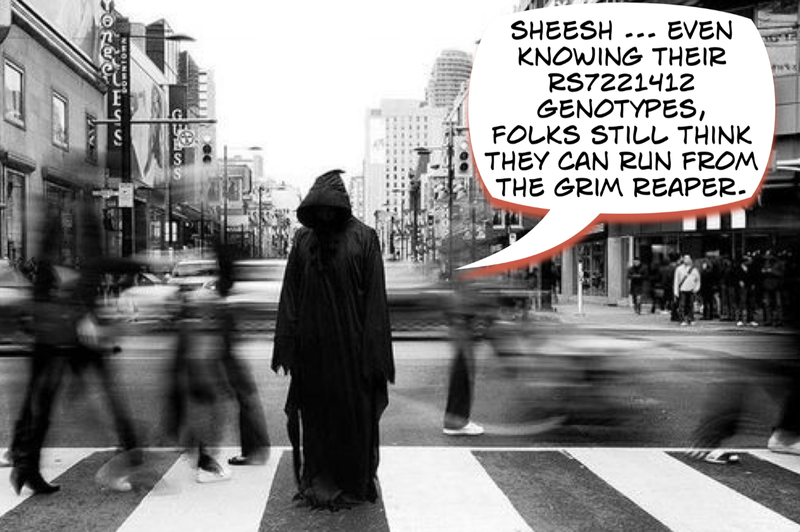 rs7221412 is not presently covered by 23andMe, but this SNP appears to sit in a haplotype block and is flanked by rs9914077 and rs2585408 … both of which are heterozygous for me … so I guess it’s strictly “carpe diem!” (or at least 7 hours of diem) for me and my AG genotype. If you’re interested in genomic predictions of this death clock … read more about your telomeres.